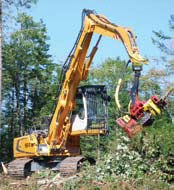 The Demo 2008 show, held in Halifax in September, featured lots of working logging equipment and was a tremendous source of informationwith plenty of new equipment, products and services on offer. When it comes to the latest technologies in logging equipment, Demo 2008 attendees pretty much saw it all during the three-day run of the very successful show, held in September just outside Halifax. This marked the first time Demo was held in the Atlantic Provincesand show organizers Master Promotions and the Canadian Woodlands Forum got it right, with lots of positive comments coming from those attending and from exhibitors. The world-class event is one of North America’s largest and most unique outdoor equipment showsit featured over 100 exhibitors on a three-kilometre loop in the forest for a live exhibition of forestry-related equipment. The show was proudly hosted by Ledwidge Lumber, a family-owned sawmill located in nearby Enfield, Nova Scotia, on one of their sustainably managed woodlots. And there was plenty of equipment to see over the three days. Logging & Sawmilling Journal highlights some of the new equipment on display at Demo below. Volvo is expanding its profile in forestry equipment, and a recent entry is the FB3800C heavy-duty tracked feller buncher/harvester. It is powered by a 324 hp, Tier III/Stage IIIA compliant, Volvo diesel engine with Volvo advanced combustion technology (V-ACT). It uses precise, high-pressure fuel injectors, a larger capacity turbocharger, and air-to-air intercooler and electronic engine controls to optimize machine performance. The carrier without attachments weighs in at 75,700 lbs, with the Volvo extreme-duty forestry undercarriage. It comes with an enhanced-for-forestry hydraulic system. The heart of the hydraulic system is the engine driven, series mounted, variable displacement axial piston pumps that provide high flow performance. A fifth dedicated hydraulic pump is added for feller buncher saw head operation. The heavy-duty forestry boom and arm with dual boom main cylinders is designed and built to withstand the lifting and twisting forces of the toughest harvesting operations. Standard equipment includes a variable speed reversible cooling fan that is electronically controlled and hydraulically driven to reduce fuel consumption and noise. The newly designed Volvo Forestry Care Cab features a multi-adjustable heated seat, enhanced operator comfort system and easy-to-read displays providing real time information on all machine functions. With all the current buzz about biomass, Bracke Forest has chosen a good time to introduce its Bracke C16.a silviculture and biomass head. It is suited to all types of mechanized clearing, sapling clearing, corridor clearing, pre-commercial thinning, thinning in problem stands, and clearing along roadsides and power lines. 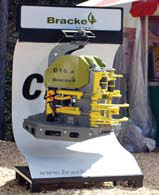 The C16.a can be attached to harvesters, forwarders and other machines equipped with a boom or crane. It is equipped with accumulating grapple arms that make it possible to easily gather and stack an assortment of fibre. The patented cutting solution makes extremely quick cuts, and consists of a self-tensioning standard cutting chain fitted to a circular saw blade. Gilbert, long noted for the flexibility of its heads, is now offering more options to allow equipment operators to gather more trees, no matter what the angle. Among its newest options is an integrated Loewen wrist that is mounted, for example, on its model 3022 felling head. This makes the head capable of 350 degree rotation, accomplished by two hydraulic motors on a powerful 6:1 gear ratio. The combination is designed for easy access to manifolds and motors, and it is compatible with all carrier configurations. 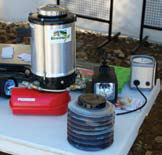 It comes equipped with a heavy duty ball bearing rotate gear, and the hoses go through the rotate for better protection. The new John Deere E-series machines had strong representation at Demo, providing the company with an opportunity to showcase its new innovations aimed at increased operator comfort and productivity. Deere’s four new harvester sizes, from the 1170E four-wheel version to the larger 1470E, as well as its new E-series forwarders, come equipped with the new cab design. It is an elliptically-shaped cab. The harvester cab rotates 160 degrees, providing the operator with more visibility. Its side-to-side and front/back leveling is greater than the forwarder, recognizing that the operator must sometimes work at awkward angles for both felling and processing activities. John Deere is also introducing six new E-series forwarders. The 1510E, for example, is an eight-wheel machine where the cab rests on a turntable between the front bogie axles and rotates 290 degrees to follow the movement of the boom from the forest floor to the bunk as the operator picks up the grapple load. STL Lubrifiants has developed a concept that uses grease instead of oil to lubricate chain saws by modifying certain components of a piece of forestry equipment. Its trademarked Envirosys product is an original management concept that combines a central lubrication system with Envirosys greasea vegetable oil-based lubricant that is biodegradable. The product has specifically been developed and adapted to the most severe conditions and environment for logging equipment. STL says the system is easy and quick to install, generally within four hours by its own technicians. The concept is totally independent from the current lubrication system, and its design allows for optimum control of the cutting performance based on the operator’s setting. They can select the proper rate at their fingertips, according to their needs. Advantages of the Envirosys product include: significantly reduced volume of lubricant used; an extension of equipment component lifespan; reduced cleaning costs; elimination of the recycling costs of plastic containers; increased cleanliness; reduced lubricant adding frequency, eliminating risk of injury during filling and eliminating discharge of toxic hydrocarbons. Caterpillar has responded to industry needs with a number of improvements to its C-Series skidder. All three models feature Cat C7 engines with ACERT technology. The engines combine improvements in fuel delivery, air management and electronic control to optimize performance and meet emissions regulations. These clean burning engines also allow oil change intervals to be extended to 500 hours, meaning more time spent in production. The 220 hp, 535C skidder is offered with a new DualHP option that provides increased power in second through fifth gears. The five-speed transmission matches engine power to the load size and ground conditions and electronic shift control (ECPC) boosts total productivity. When the lock-up torque converter is engaged, travel speeds can be as much as 15 per cent higher. Hultdins offers a portable bridge for forestry use made for stream water crossings. It can also be laid down to cross swamps or wet terrain. The portable bridge is said to be easy to transport, handle and position, providing logging operations with extra harvesting time each year. It minimizes stream and ground disturbance, is built for repeated use and different locations, as well as rapid installation and removal. The Hultdins Terrainbridge 500 measures 16’ long, 4’ wide, 2’ tall, and weighs 1,370 lbs. It is constructed of high-strength steel sections, all connected by steel cables, like an inverted suspension bridge. This unique design concept makes it vertically strong and flexible on the longitudinal direction so that the bridge adjusts itself to all types of terrain. A key in today’s challenging logging environment is delivery of larger payloads while minimizing ground disturbance. Tigercat’s answer to this challenge is its new 635D six-wheel drive skidder. It is designed to haul large, heavy payloads in difficult terrain as well as sensitive site applications. The long wheel base and wide-spread bogie axle minimize ground pressure and maintain front wheel traction. The skidder has also been designed with extreme duty in mind with strength optimized frames, consisting of a strong centre section and robust wide spread rear bogie axle. Equipped with a Cummins QSB 6.7 Tier III engine, it delivers 260 hp at 2,200 rpm, and is capable of reaching a top speed of 13.5 kms per hour. The enhanced hydrostatic drive system has an extremely efficient driveline, automatic variable engine speed for high fuel efficiency, and an operator-controlled maximum speed setting. The electronic control system has also been enhanced for improved user interface, better fuel economy, and provides precise control of all machine functions. 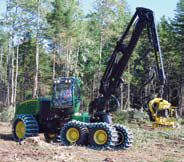 An operator’s cab can sometimes contribute to ailments such as musculo-skeletal disorders due to the extent that logging equipment is working in uneven ground. The answer could be Wallingford’s Sit Right F/B-Tilt automatic seat leveler. With this device, operators can more easily work in steep slopes and hilly terrain. Studies conducted by the Swedish Institute of Forestry Research indicate that about 50 per cent of forest machine operators have musculo-skeletal disorder of varying degrees because of sitting in tilted positions. The Sit Right F/B-Tilt is a complete unit and has all functions built into the unit and the control box. With the control box, the operator can program functions such as leveling speed, tilt (11 degrees forward and eight degrees backward) and the Home position. It can also be preset to three different driver profiles. Whether it is the F-345 Forestar LS-2 or the F-346 Forestar Flotation LS-2 tire, Alliance Tire is working with loggers to provide them with the solutions they need to operate efficiently and consistently in tough working environments. The Forestar series was developed mainly for modern and sophisticated forestry equipment. For example, the LS-2 directional tread design with strong, high and durable lugs is capable of dealing with the toughest forestry conditions. Basic nylon tire structure is reinforced by strong steel breakers as an efficient puncture protector, as well as an additional global tire strengthener. Resource industries are under constant scrutiny for their work-alone and check-in policies for lone workers. At the same time, companies’ obligations to protect such workers with regular check-in and tracking practices are becoming increasingly strict. The SPOT Satellite Messenger is Globalstar Canada’s new and affordable GPS-enabled communications solution that provides a simple way to address work-alone and check-in requirements. Lightweight, rugged and reliable, the SPOT generates different types of messages for a series of email addresses, mobile phones via SMS, or to a worldwide 911 facility, depending on the level of urgency. All signals include detailed GPS co-ordinates. SPOT is also waterproof to one metre up to 30 minutes, floats, and weighs just over seven ounces. To remind loggers that they have options, Liebherr profiled its R924C Litronic carrier equipped with a Keto head at Demo this year. One of the advantages that Liebherr carriers offer is the option of an improved vantage point. It can be equipped with a rigid cab without elevation, rigid cab with elevation, or the company’s renowned hydraulic cab elevation. The Liebherr D934S four-cylinder, in-line diesel engine delivers 177 hp at 1,800 rpm. It is turbocharged, after-cooled and fuel-cooled for reduced emissions. The engine is one of the most advanced technical innovations on this carrier, with its PLD injection system and conformity to Stage IIIa/Tier III emissions standards. The fuel cooling system and the constructional separation made between the hydraulic fluid and the fuel tanks are further innovations. They provide an efficient means of monitoring fuel heating and ensure top performance at all times. There are a number of settings possible on the hydraulic system. ECO is for especially economical and environmentally friendly operation, POWER is for maximum digging power and heavy duty jobs, and FINE is for precision work and lifting through very sensitive movements. The hydraulics are also versatile, with 10 pre-adjustable pump flows and pressures for add-on tools. 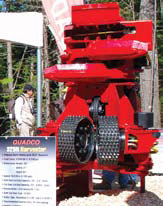 Visitors were treated to the unveiling of a new Quadco harvester head at this year’s Demothe 325H harvester. Weighing in at 5,600 lbs, it is recommended for a carrier size of 22 tons and up. The head is able to process and sort stems up to 25.5” in diameter. It has a feed force of 8,200 lbs at 4,200 psi. Feed speed is 15.5’ per second.